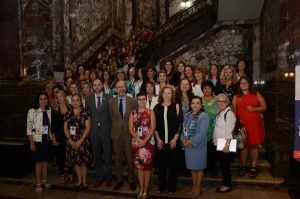 Rosario, Argentina, March 22, 2019 – Organized by the Inter-American Organization for Higher Education (IOHE) program, the Space of Women Leaders from Higher Education Institutions in the Americas (EMULIES), the first Congress of University Gender Policies was held on March 14 and 15, in the city of Rosario, Argentina. The event, which gathered more than 100 participants and more than 30 exhibitors, was organized in collaboration with the Universidad Nacional de Rosario (UNR) in its capacity as Vice-President IOHE – Southern Cone, the program Género y Universidad de la UNR and the Pontificia Universidad Católica del Perú (PUCP). 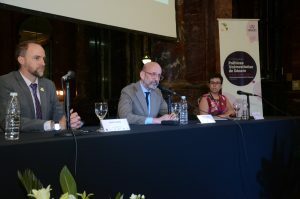 This congress was also sponsored by the Canadian Embassy in Argentina, the Asociación Argentina de Estudios Canadienses (ASAEC), the UNESCO Chair in Gender Equality in Higher Education Institutions (PUCP) and the UNESCO Regional Chair on Women, Science and Technology in Latin America (FLACSO Argentina). The Congress tackled two main themes linking research and the implementation of concrete actions in the field of gender policies in higher education: (a) Knowing the situation of women in higher education institutions, and b) Based on the points made above, learning about strategies, experiences and good practices related to university gender policies. These lines of research were presented by Ana Buquet and María José Rodríguez, during two days, as well as in six panels on leadership and conciliation strategies, science and innovation, gender violence, processes implementation of university gender policies, rectors institutionalizing equality and the state facing university gender policies. 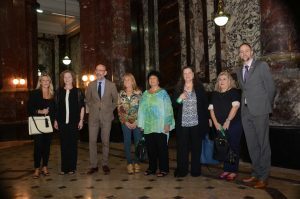 Among the speakers, one must mention the participation of representatives of the Argentine government (Minister Erica Hynes, Minister Claudia Balagué, MP Mercosur María Luisa Storani), the chancellors and vice-chancellors (Sara Ladrón de Guevara, Agustina Rodriguez Saa, Mónica Coca, and Doris Cevallos) and recognized academics, researchers and thinkers from Latin America (Dora Barrancos, Diana Maffia, Patricia Gomez, Gloria Bonder, Lidia Heller, Diana Kiss, Patricia Diana Kiss, Patricia Giustiniani, Liliana Castañeda, Maria de Los Angeles Rodriguez, Analía Aucía, Luz María Velazquez, Sabrina Benedetto Lorena Crespi, Olga Corna, Violeta Jardón, Beatriz Rodriguez, Meritxell Calbet). To learn more about the EMULIES program, feel free to write to emulies@oui-iohe.org, follow the program on Facebook and Twitter and visit its website.